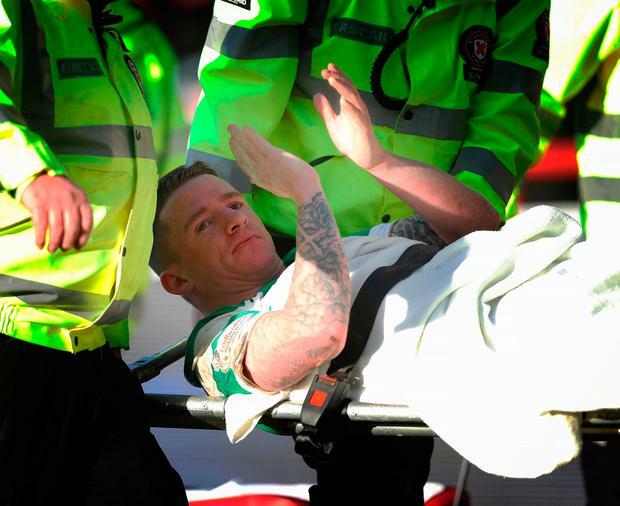 Celtic and Ireland star Jonny Hayes is facing six months on the sidelines with a fractured tibia. Winger Hayes was stretchered off in Celtic's 2-0 win away to Dundee yesterday and Independent.ie understands he will undergo surgery today to have a metal rod placed in his leg. Bhoys boss Brendan Rodgers was hopeful that Hayes suffered just bruising after a robust tackle from home defender Josh Meekings, who was also unable to continue. Rodgers had no issue with Meekings' role in the incident that is a devastating blow for Hayes after he finally got a run in the Hoops' side and scored against his former club Aberdeen last Saturday. "There was nothing in it," said Rodgers after the match. "Two tough players and let's hope they are OK.
"I was looking directly at his (Hayes) fibula to see what state his leg was in, but it must have just been the clash of shin-pads, although he was down for a while so it was clearly hurting him. "The medical team tell me he will go for an X-ray and we will see where it is at, but we are hoping it is only bruising."